The Hyundai Veloster has always looked fast, but it’s never really backed that up with tons of speed. That changes now, because the Korean brand just launched the 275 horsepower 2019 Hyundai Veloster N at the Detroit Auto Show, bringing Hyundai solidly into the hot hatch segment. And it’s about time we got some excitement around here. 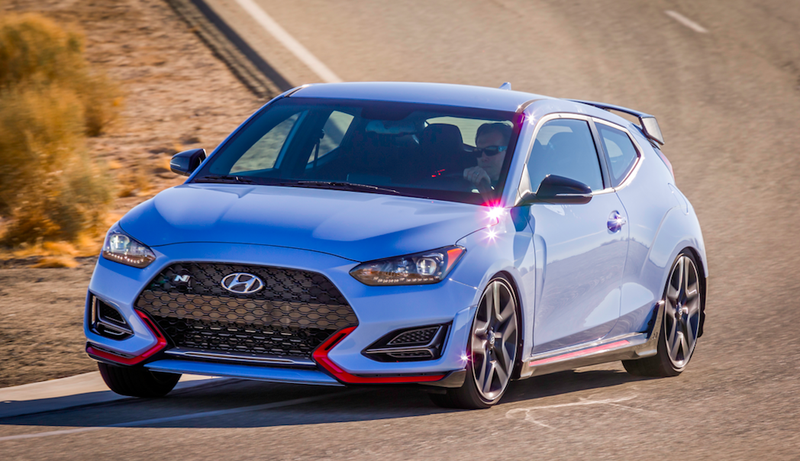 If you’ve read any Hyundai Veloster Turbo reviews through the years, you’ve likely heard that the little asymmetric, three-door hatchback has been quick and weird and fun, but maybe not quite as sharp on the track or as quick as the wide, low-slung looks suggest. But now, on top of a 201-horsepower turbo Veloster, there’s a Veloster N, which makes a healthy 275 horsepower at 6,000 RPM and 260 lb-ft at 1,450 RPM—all from a 2.0-liter T-turbo four-cylinder. The front fascia and grille are unique to the N model, and there are ducts up front to keep the brakes cool. There are also aggressive rocker panels, and standard 225-section Michelin Pilot SuperSport tires on 18-inch wheels and 235-section Pirelli P-Zero summer tires for the optional 19s. Bringing those wheels to a stop are standard 13-inch rotors up front and 11.8-inchers up front, though 13.6-inch and 12.4-inch discs—front and rear, respectively—are also available. There’s a cool rear spoiler, a lower fascia with an integrated splitter, and “high flow” dual active exhaust that my coworker Andrew said was quite loud based on Hyundai’s video at the debut. Plus, on the inside, the new Hyundai hot hatch gets unique sport seats and an N-design steering wheel and shift knob. Will this be a cheaper GTI alternative? How will it fare when put up head-to-head with the Ford Focus ST? We’ll have to wait and see. But between the aggressive looks and 275 horsepower, I think it’s safe to say it’s time for enthusiasts in the U.S. to rejoice.